Today, I answered this question. It seemed like a simple issue, and in an effort to get it done quickly, I submitted an answer with the code and added, "This should be what you're looking for" (see the revision history here). Within a minute, a comment was posted saying that I should expand my answer, to help future readers. While this comment was being made, I was already in the process of rewriting the top section of my answer to provide an explanation. I then replied to the comment, mentioning that they should give the answerer a few minutes before commenting, in order to give users a chance to improve their answer. A moderator then added a comment, (while deleting my original comment), and stated that a user doesn't need to wait, and that I should hold off my answer until it's ready. While I disagree with that statement, the fact that they deleted my comment made the entire situation moot. I felt it like using their power to enforce their opinion. This would have been an awesome reply, and it would have encouraged me to do something similar in the future. Because my comment was deleted (In the middle of the discussion), people weren't even offered the chance to reply. Therein lies the issue that this post is about. How, as the public, should we handle things like this? Do we create a Meta post and try to ping the original user to view it? It seemed like it was right to proceed with the discussion in the comments. 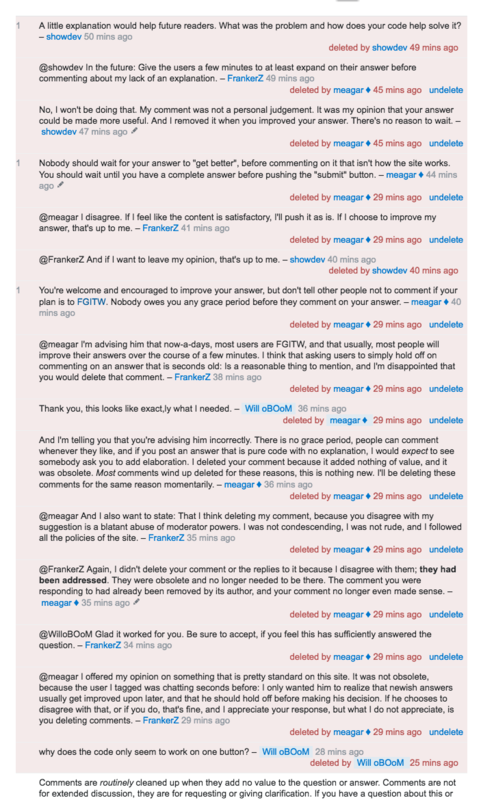 EDIT: This is not a duplicate, because while this discussion mentions FGITW and placeholder answers, this post is more about how the situation was handled by the mods, and how to approach this subject in the future. The act of placing the reply, deleting my original question, and follow-ups. We've had positive comments in the replies below, and I think this post has done what it was set out to do. That's it. Any other use of comments subjects them to removal at any time. Every single one of the comments posted (except for the original "A little more explanation would be helpful") had to do with meta site mechanics, and not with the post content. He claimed that the comment was "obsolete", but it felt like he was using his power to enforce his opinion, which I disagreed with. As I said, your comment was a reply to a comment that had been deleted by its author. When I came across your answer, it had an orphaned comment that made no sense because the comment it was replying to had already been removed, and you had addressed the comment by adding context to your answer. This is the very definition of an obsolete comment, the kind that is routinely flagged and cleaned up. Rather than waiting for somebody to flag it, I removed it as it was adding absolutely no value and no longer even made sense. The original comment by the other user become obsolete when the post was edited as it didn't apply any more. The rest of the discussion, being a discussion over whether or not it's appropriate to post bad answers that should be immune from correct and valuable feedback since that feedback would result in a correct indication that the low quality answer is in fact of low quality, was simply off topic. If you're interested in discussing this with the user, you're free to talk with them in chat, ask a relevant question on meta, etc. You can even discuss it in comments if you want, but you run the risk of a mod deleting the completely offtopic comment chain if they happen to come across it (through a flag or otherwise). It's just the risk you run of holding an off topic discussion in comments. Not the answer you're looking for? Browse other questions tagged discussion deleted-comments answer-quality fastest-gun . Placeholder Answers: Will update with answer soon! Is it all right to flag very new answer as 'very low quality'? What should I do with comments I made that are due to my typo? Should I leave comments suggesting that posters improve their formatting?